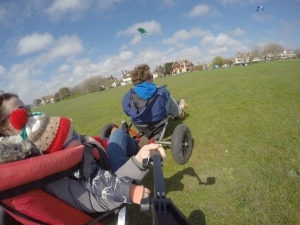 Didn’t think you could go Kite Buggying because your disabled, paralyzed or lacking mobility or control over some limbs or your body? 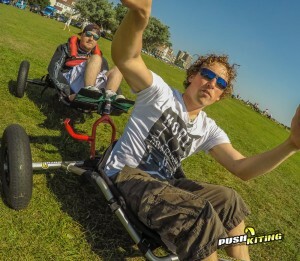 With our great friend Alex Campbell, we have made a custom built Tandem kite buggy, Alex as a Quadriplegic is paralyzed from the chest down with the partial movement of his arms, however, he has always maintained his love of the extreme! 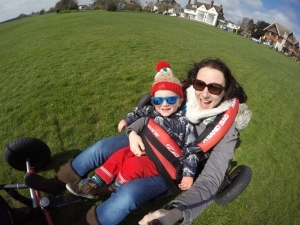 Alex loves the feeling of flying about in the kite buggy just inches off the ground at speeds up to 25+mph! 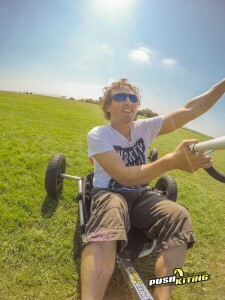 An amazing experience or way to try out kite buggying and exhaust a few instructors! 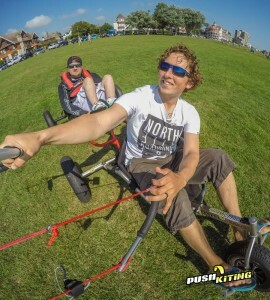 Check out the guys who’ve tried our tandem and disabled kite buggy so far! 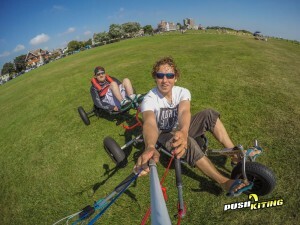 What’s the cost of Tandem and Disabled Kite Buggy experiences? 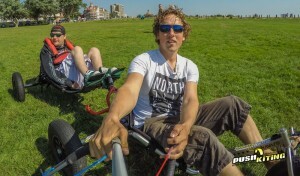 Who’re the Tandem Kite Buggy Lessons for? 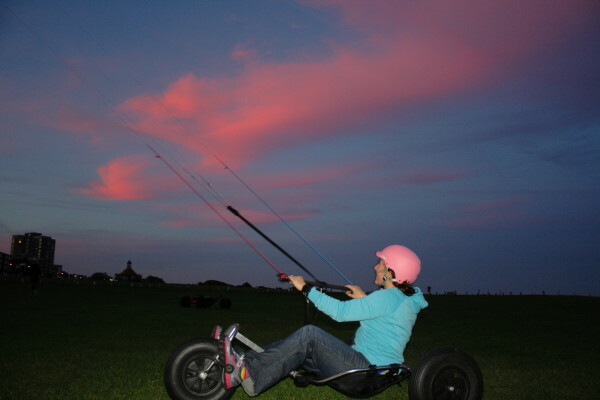 You want to see how fast kite buggies can go, and get a full experience before starting lessons. 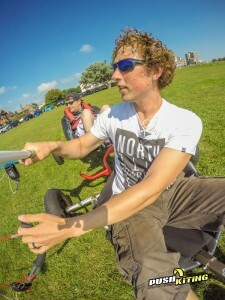 You’re disabled but you need that adrenaline hit, you want to see if you can take part and see how much you can achieve! 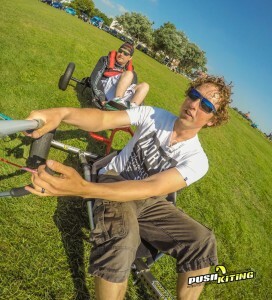 You’re a bit young to control a kite buggy yourself but really want a go! 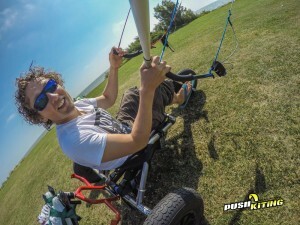 You want to learn specific elements or advanced techniques involved with kite buggying. 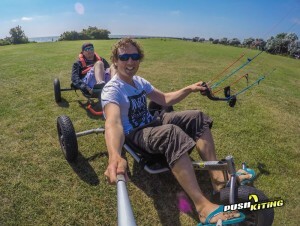 You want to give someone an experience of kite buggying but don’t think they’re up to the challenge of piloting a buggy themselves. 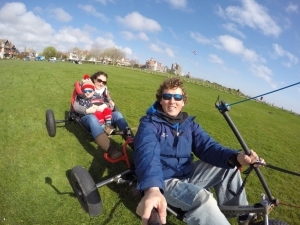 We’ll get you set up in the kite buggy and then give you a guide to kites, show you why we’re using the kites we’ve selected for each day and talk you through the setup process whilst we get prepared. 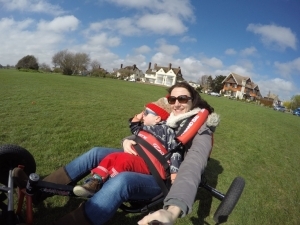 We’ll get you fitted in the buggy and be off on our merry way at a very leisurely pace. 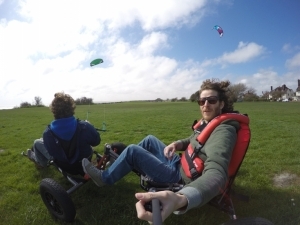 Once you’re comfortable then we can start picking up the speed and increasing maneuvers, we can have frequent breaks and get feedback from you as to what type of kite buggying your after and see what you’d like to experience next. Let us know of any disabilities/injuries you think we should be aware of or special considerations before you arrive. Please come along with a pair of standard trainers, sunglasses and other appropriate equipment specific to the course you’ve booked. Recommend a friend and they book a lesson and you could get a 5% discount off your next lesson. Just tell us who is and what lesson they have booked and when it took place and when you book your next lesson.